In the past, Japan's aquaculture was concentrated mainly in bays, but due to the appearance of red tide, operations began to be moved to cleaner environments offshore. However, worsening water quality in both bay and offshore environments, due to organic wastes and leftover food, and increasing maintenance and equipment costs, has brought continued decline to the industry since its peak in 1985. At OPRF we undertook research for the development of an environmentally friendly yet cost effective land-based abalone aquaculture system. The system we devised is composed of a compact easy-to-use cultivation bed and filtering tank inserted into used refrigerated ship containers. 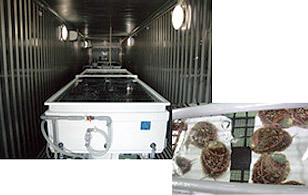 The simplicity of design and materials used in the Land-based Abalone Aquaculture System (SOF Aquaculture System) keeps initial investment and running costs low. We are continuing to refine the system toward making it available for wide practical application. 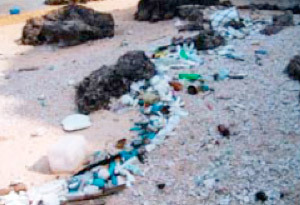 Ocean debris drifting on the seas and ashore is not only unsightly and affects the ecology, but is expanding into a global problem. To solve this problem, it is necessary to have not only a unified management system for land and sea areas but also a social activity system to solve the local debris problems in cooperation with the public and private sectors. OPRF has carried forward popularization of a "local action system contributing to conservation of the marine environment" by introducing environment tickets for seashore cleaning and debris craft workshops. This has been done in cooperation with citizen groups nationwide. 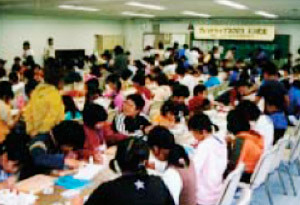 In February 2005, those from nine areas of the country who had engaged in community activities gathered in Tokyo for an exchange conference, where they presented case studies and exchanged opinions. It is anticipated that the action system, which OPRF presented as a model, will be expanded into other areas.